Take a seat inside this human-sized zoetrope, pull the bar back and forth and watch as fairytale imagery come to life around you. 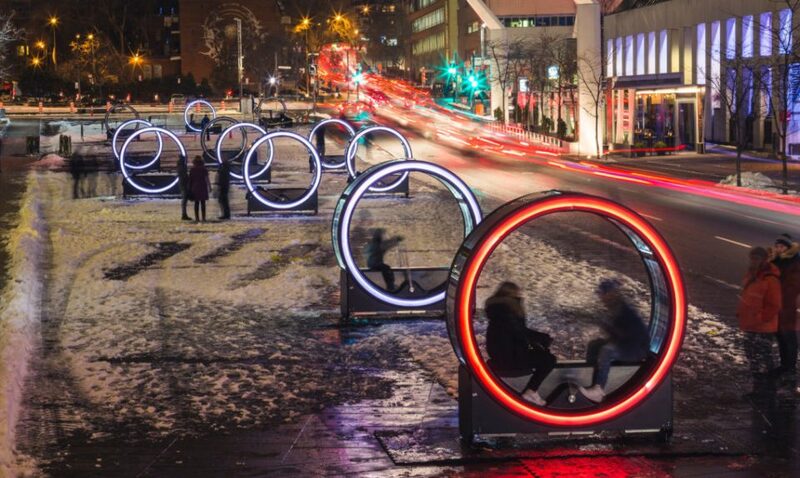 ‘Loop’ is the main installation at this year’s Luminothérapie, an interactive public art installation competition that takes place in Quebec each year. 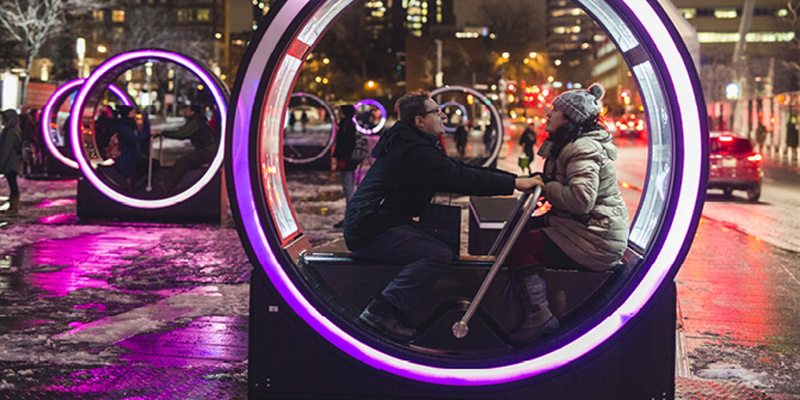 Developed by artists Olivier Girouard and Jonathan Villenueve in collaboration with Ottoblix, ‘Loop’ tells 13 different stories in each of the oversized illuminated circles placed along a street in Montreal. The zoetrope, in case you’re not familiar, is a pre-film animation device that displays a sequence of images within a cylinder to produce an illusion of motion; users look through slits in the cylinder to watch it. ‘Loop’ takes this traditional object and updates it with interactivity and light, asking users to power the spinning cylinder themselves. A flickering strobe light illuminates the monochrome images lining the inside. 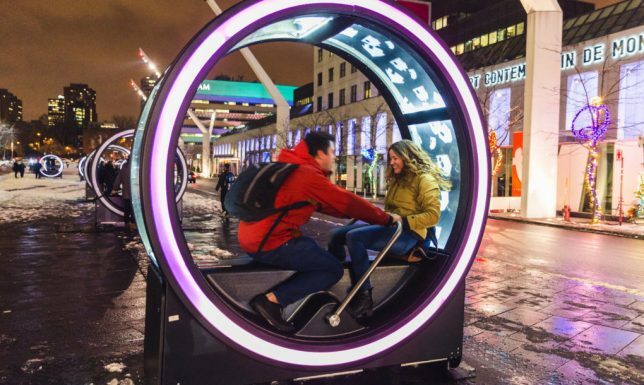 ‘Loop’ took three months of design work and 800 hours of assembly to complete. One of the designers makes a living building Lego sets, while the other has been designing since he was just a child. Explaining how they came up with the concept, Olivier Girouard says Villanueve took inspiration from mechanical interventions at Berlin’s Technology Museum. 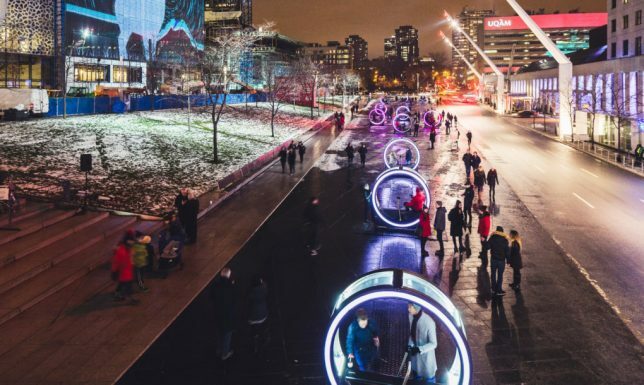 Loop will light up the Place des Festivals in Montreal until January 29th, when it will take off on a tour of Quebec cities. Check out last year’s installation – a series of illuminated see-saws.